Abstract: Dr. Maria D’Orsogna is a physicist and math professor at California State University Northridge. She is also a hands-on activist fighting to protect the Italian countryside and seas from Big Oil. 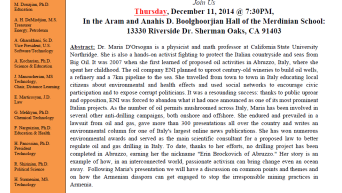 It was 2007 when she first learned of proposed oil activities in Abruzzo, Italy, where she spent her childhood. The oil company ENI planned to uproot century-old wineries to build oil wells, a refinery and a 7km pipeline to the sea. She travelled from town to town in Italy educating local citizens about environmental and health effects and used social networks to encourage civic participation and to expose corrupt politicians. It was a resounding success: thanks to public uproar and opposition, ENI was forced to abandon what it had once announced as one of its most prominent Italian projects. As the number of oil permits mushroomed across Italy, Maria has been involved in several other anti-drilling campaigns, both onshore and offshore. She endured and prevailed in a lawsuit from oil and gas, gave more than 300 presentations all over the country and writes an environmental column for one of Italy’s largest online news publications. She has won numerous environmental awards and served as the main scientific consultant for a proposed law to better regulate oil and gas drilling in Italy. 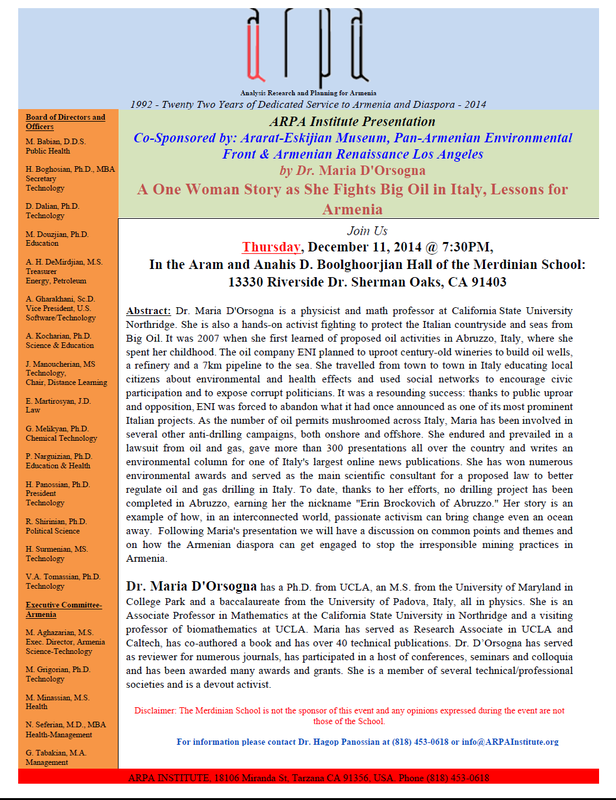 To date, thanks to her efforts, no drilling project has been completed in Abruzzo, earning her the nickname “Erin Brockovich of Abruzzo.” Her story is an example of how, in an interconnected world, passionate activism can bring change even an ocean away. Following Maria’s presentation, we will have a discussion on common points and themes and on how the Armenian diaspora can get engaged to stop the irresponsible mining practices in Armenia. Dr. Maria D’Orsogna has a Ph.D. from UCLA, an M.S. from the University of Maryland in College Park and a baccalaureate from the University of Padova, Italy, all in physics. She is an Associate Professor in Mathematics at the California State University in Northridge and a visiting professor of biomathematics at UCLA. Maria has served as Research Associate in UCLA and Caltech, has co-authored a book and has over 40 technical publications. Dr. D’Orsogna has served as reviewer for numerous journals, has participated in a host of conferences, seminars and colloquia and has been awarded many awards and grants. She is a member of several technical/professional societies and is a devout activist. Disclaimer: The Merdinian School is not the sponsor of this event and any opinions expressed during the event are not those of the School.